Allermuir has become one of the leading manufacturers of high quality contemporary furniture in the UK today, bringing some of the most exciting and talented European designers work to the marketplace. 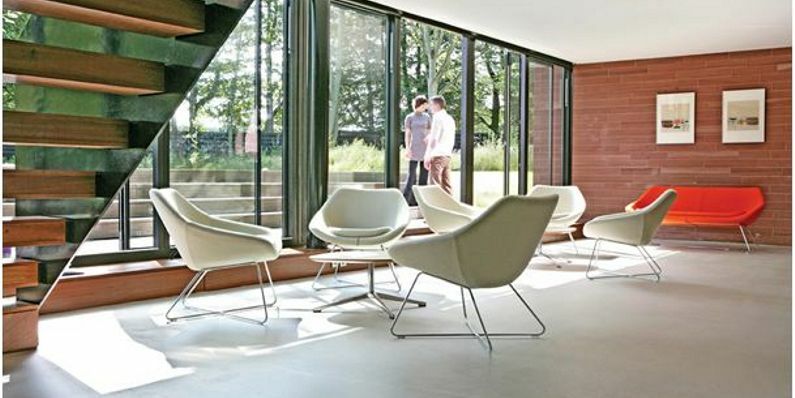 Offering a comprehensive and diverse collection of products, Allermuir specialises in supplying furniture primarily for leisure and corporate environments, such as dining areas, cafes, breakout areas, reception areas, public spaces and bars. Allermuir has been exporting into the US for a number of years, with annual growth within the market. As a result Allermuir established a new production facility in Maumee, Ohio, in 2006. This facility offers a range of products under a Quick Ship program, with existing Allermuir collections being available on standard delivery times. Our Company is renowned for promoting good product design with meticulous attention to detail, whilst meeting the functional requirements of the interior and as such, it is and will continue to be, the policy of the Company to develop high specification products based upon inspirational designs, which are suitable for and appreciated by a demanding and competitive marketplace. Allermuir is a member of the anti copying in design organisation.